...the territory of the Russian Federation. In May, Iridium announced that its Russian subsidiary, Iridium Communications OOO (Iridium Russia), had received regulatory approval for this expansion of the world’s leading global communications service, and the beginning of authorized commercial service is an important step in this process. The Iridium service is essential to important sectors that are prominent throughout the Russian Federation, including maritime, aviation, emergency response, civil government, oil and gas, mining and transportation. Iridium Russia will be able to serve these markets within the country both this year and well into the future thanks to our planned launch of our second generation network, Iridium NEXT. 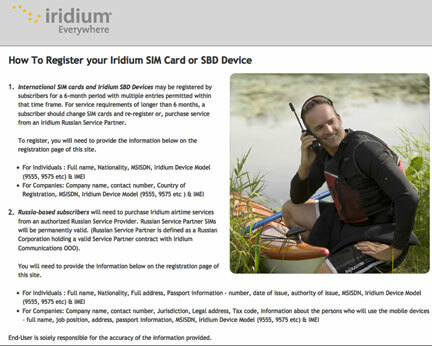 Iridium subscribers interested in using the service in the territory of the Russian Federation must register their device at www.iridium-russia.com.